At first glance, this helmet might look like it has taken a few too many blows to be of use, but do not let that fool you. This Late Roman Ridge Helmet looks exactly like it should and will still offer fantastic protection to any warriors skull. Rather simple in construction, this helmet features a rounded skullcap that is perfect for deflecting blows off the crown of the helm, while also featuring a ridge across the helms centerline for added strength and reinforcement. Cross-hatch marks have been engraved into the helms surface, while a pair of ovals has been embossed into the helmets front section, all in order to enhance both the appearance and the strength of the armour. The helmet also features side protectors that hang from the sides of the helmet, without obstructing the wearers hearing, as well as a back flap that offers a modicum of protection to the warriors neck. 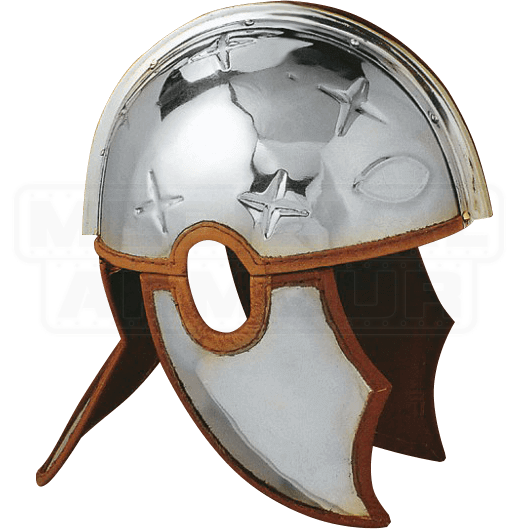 This helmet is made from quality metal and features a simple polished metal finish. 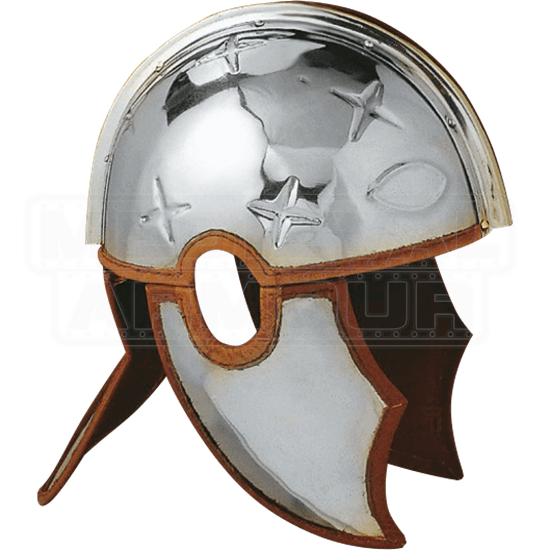 All in all, this Late Roman Ridge Helmet would make a great addition to any Roman costume, whether worn for fun or worn for the purpose of reenactment, and it would also make a great addition to any history enthusiasts private collection.